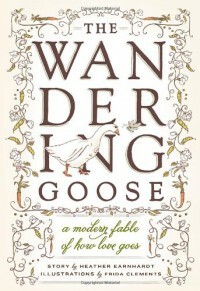 Like all fables, The Wandering Goose is short, sweet, beautifully illustrated, and teaches a valuable lesson - in this case, a lesson about how love goes. It realistically describes the stages of emotion felt during the course of a relationship, and reminds us that it is possible to find love in our life even in the midst of heartbreak. This review can also be found at The In-Between Place. Thanks to Edelweiss for providing me with an advanced copy in exchange for an honest review.